You’ll be amazed at what a little change like upgrading a window sill can do to a home! While many builders are trying to out-do their competitors with grand features, the smart ones are utilizing an affordable, yet effective way to make a big impact on their builds. When you make strides to do something different than your competitors at an extremely reduced expense, you’re increasing your company’s chances of becoming more successful. It’s important that you not only add value to your build in order to sell it, it’s also a smart business move if you can sell that feature to your buyers. When you’re installing quality material like plumbing and electric, buyers will certainly appreciate it, but they can’t actually see the work behind the walls. It’s something about being actually able to see where their money’s going. If you’re looking to make a big impact on your future builds without busting your construction budget, then upgrade your builds with something that’s an absolute necessity and that everyone can admire. Yes, window sills! You to have to buy them anyway. Why not upgrade them to marble? Now, you might be thinking that marble is pretty expensive and incorporating that into a build doesn’t sound like a cost-efficient expense. Please keep in mind that we’re not suggesting that you install marble floors. That’s an entirely different project. We’re talking about installing marble window sills. Q. But don’t you need marble floors in order to install marble window sills? A. Who told you that, a marble floor distributor? Look, when it comes to a build, as a building contractor, you can do anything you want, but be smart about it. Be creative, but be creatively smart! Remember, you want to sell your builds. So that means that you have to appeal to as many buyers as possible. Yet, at the same time, you have to do something different that’s eye-catching, but doesn’t repel buyers from buying your homes. That’s why installing marble window sills is the perfect solution for standing out against the competition. 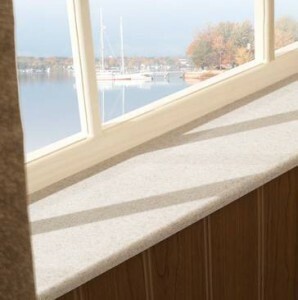 Window sills are usually made of wood, vinyl, or tile. Wood is usually the common choice for window sills because it’s fairly inexpensive and you can paint it any color. However, builders have been more susceptible to vinyl because it has a cleaner finish and resists moisture better than wood. As a result, it lasts longer and requires less maintenance. Tile shouldn’t be ruled out either as it also shares the same benefits as vinyl with one exception: grout. It can discolor and with it being used as a window sill, it may require a bit more repair and maintenance. With marble window sills, you don’t have to worry about that at all! Marble stone is self-sufficient and stands on it’s own as a diverse and durable building material. Part of the reason marble window sills is so strong is because it’s made up of many different stones and fossils fused together through a metamorphic process. Marble is primarily made of up travertine, a mineral that’s formed above ground. The process of tectonic plates moving about and sometimes pushes that limestone deep beneath the earth along with other minerals and fossils. If all those minerals go too deep, then all of that organic substance is susceptible to nearing the earth’s core that has a temperature hot enough to melt the rock. When that happens, that limestone gets fused with all of the surrounding materials, then crystalizing into a new form of mineral we know as marble once it cools. So marble is like an organic fusion of different types of rocks fusing together making it stronger than it already was before the metamorphic process. What makes marble so unique is the way it’s organically formed. Depending on what kind of minerals and fossils is surrounding the rock during it’s metamorphing process can make all of the difference between mining White Carrara, Emperador Brown, Bardiglio Gray, or even a Black Granite. When it comes to color, it’s really going to be the surrounding fossils that determine the color and veining pattern. So, when it comes to nature, you’ll be given a wide variety of marble window sills to choose from. When it comes to building a neighborhood of residential homes, the problem will be choosing the right one to stock for your future builds. Now since marble comes in a variety of colors and patterns, it’s important to stock what’s going to appeal to most buyers. And although neutral colors like Crema Sahara Marfil and even Pure White Thazoz often blend in seamlessly with almost any décor, the Bardiglio Gray and Black Granite are also great as an accent wall, especially for built-ins. The bottom line is if you’re looking to do something different with your builds that’s easily noticeable, yet doesn’t stretch your project’s budget, install marble window sills. You’ll be amazed at what a difference a small adjustment like this can make, especially if you install a contrasting color to the finish. That contrasting color doesn’t necessarily have to be vastly different. For instance, if you’re installing dark walnut hardwood flooring into your build, the Emperador Brown window sill would naturally complement the interior design nicely. However, if you want to present a slightly bold, yet modernistic design, the Black Granite window sill would make for a clean and dramatic statement. Stonexchange, a marble wholesale distributor and manufacturer in Miami, Florida has direct access to quarries in over 10 countries, including Turkey where 1/3 of the world’s marble is mined. Take a look at Stonexchange’s online catalog of marble window sills. You’ll find that we only stock what’s most popular in today’s building industry. So the chance of you choosing the wrong type of marble window sills to stock is slim to none. Contact our customer service department today to discuss how to place your order of marble window sills for your next build. Our phone number is 1-305-731-2400.